"I endure only the worst to achieve only the best." Ronovi Tavisaen is an Epicanthix hailing from Yridia IX, a Warlord in the Dark Jedi Brotherhood, and the current Proconsul of Clan Plagueis. Most recognized as the first female Headmaster of the Shadow Academy, she also served as Consul of Tarentum and was an honored Tarentae and vassal of Arcona. A controversial individual with a colorful past, Ronovi is viewed by some as a respectable mentor and leader, while others consider her to be nothing but an erratic, violent, and unreliable drunkard. "I did not fall to the dark side. I was not seduced by the dark side. Falling indicates passivity. Seduction indicates a lack of control. I chose the dark side. I chose power." A blindfolded Ronovi being trained in instinct by her father, circa 14 ABY. Ronovi's father, Zane Tavisaen, was a prominent spacer and pilot in the Outer Rim and had a strong affiliation with the Galactic Empire. On his home planet of Panatha, he met and fell in love with his future wife, whose affection settled his bitterness toward the Rebel Alliance at least partially. The two married in Tree City before traveling to Yridia IX in the Yridia system, where they temporarily resided in the center of Eden, a burgeoning metropolis. When his wife became pregnant, Zane moved with her to the outskirts of the city where she gave birth to a son, Yaske. She then gave birth to Ronovi in 4 ABY, shortly after the emperor's death, and had a second daughter, Sarit, four years later. Ronovi was raised on strong family values and taught to cherish being with her parents and her siblings as much as possible. Unlike the other Epicanthix, who were known for conquering other planets in the Pacanth Reach, Zane wished for a quieter life. He seemed happy enough being a mechanic, busily repairing starships and freighters owned by Eden civilians. However, Ronovi desired to be a warrior like her ancestors, even though her brother began to follow in their father's footsteps while her sister delved into science and literature. It wasn't until she was ten years old that her father took an interest in teaching her martial arts, as he himself had practiced fighting techniques when he was young. 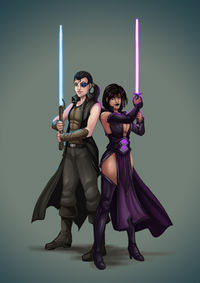 Zane instructed Ronovi to value her instincts in combat and maintain perfect control over her reflexes. He exposed her to a variety of fighting styles, teaching her how to use everything from a short staff to a dagger to her bare hands. While her mother disapproved of her daughter learning how to fight, Ronovi, the black sheep of the family, wasn't looking back. After the conclusion of the Yridian Revolt in 18 ABY, Zane decided that the family should return to one of the major districts in Eden so he could extend his business in ship maintenance. It was there that he first allowed and even encouraged Ronovi to both learn about and dabble in darker arts. Ronovi concluded from her research and experiences that the dark side was the true source of perfection, and that it was responsible for her increasing notoriety as she grew older. Ronovi the brawler, circa 20 ABY. Ronovi's decision to become a brawler was mainly due to her city's reputation. Although her parents were strictly middle class and law-abiding citizens, her residence in District III of Eden City was surrounded by darker influences. The adolescent was introduced to underground fighting rings in District IV, where spectators would audaciously bet on who would get slaughtered in death matches. She quickly earned a name as a suitable challenge for many skilled combatants, becoming infamous for her agility and aggressive moves. However, every altercation would result in one battle scar or another, and soon, Ronovi found herself duking it out not only in what was considered to be the most savage part of the city's entertainment industry, but also with angry rivals on the street. Nonetheless, Ronovi was not particularly happy with her level of skill as a martial artist. Her father stopped training her once she turned sixteen, telling her that he had taught her everything he knew. She continued to associate herself with the underground ring for the next two years, and it was during one evening's round of matches that she garnered the attention of a Tarenti Journeyman named Dralin Fortea. After several bouts with weaker adversaries, the Epicanthix was paired against one particularly famed duelist and began to gain the upper hand just before she noticed that her opponent was drawing a dagger from his sleeve. It was then that Ronovi first demonstrated that she was a Force-sensitive, displaying unnatural power as she threw her challenger halfway across the room before he could stab her. The next morning, Dralin spoke privately with Zane, telling him that he was interested in recruiting the eighteen-year-old girl into the Brotherhood. Ronovi quickly agreed to the offer after her father told her of the encounter, believing that it was the best opportunity for her to become more powerful and renowned. She was shipped to the Shadow Academy to begin her initiation into the Obelisk Order, leaving her meager belongings behind. After completing her preliminary training, Ronovi was then transported to the Sword's Sheath on the Itaana belt, where she became Dralin's first true friend and a full-fledged member of House Gladius within Clan Tarentum. Ronovi as a new member of Gladius, circa 22 ABY. 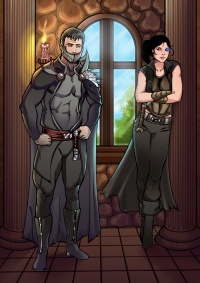 Ronovi was welcomed by her Quaestor, Telona Murrage, and fully inducted as a Gladian upon arriving at her house. She soon learned that she had been initiated into Tarentum at a time of conflict within the Yridia system. The clan's most recent troubles lay with Deutta the Hutt, a crime lord who held dealings with Tarentum's enemies in order to overthrow its government. 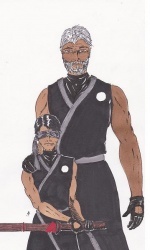 Therefore, Consul Anshar Kahn Tarentae arranged a strike team to intercept and eliminate Deutta on Karideph. 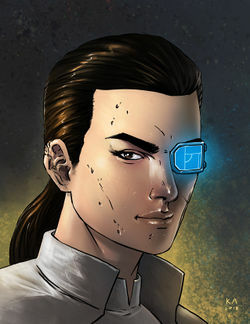 Ronovi became one member of said team, and it was during the mission that she encountered the controversial Tarentae known as Doni Tzu, who had been captured by enemy forces. After inadvertently saving Doni Tzu's life, Ronovi became his apprentice as soon as she recovered from her battle injuries. Doni Tzu was notorious for being ruthless to both his enemies and his peers, as well as for angering even the most prestigious members of the Dark Council. With her master's reputation in the back of her mind, Ronovi learned much from him when it came to diplomacy, meditation, and basic Force powers. She would continue to receive lessons from him until she was told of his unexpected departure from the Yridia system after a crisis within Gladius that left Apollo, a veteran of the Emperor's Hammer, as the house's new Quaestor. Ronovi participated in a clan strike on Prakith following her master's sudden exodus, helping to seize and plunder a facility containing various technologically advanced weapons and devices. Her work so impressed her house summit that she was appointed the new Sergeant of Arcano Signum, a battle team led by Dralin before he stepped down as its Tetrarch. Ronovi also began studying military tactics and combat as part of her academics, and Maxamillian von Oberst-Tarentae, pleased with the Obelisk's strategic knowledge, made her a Lieutenant Colonel of the I Corps in the newly reformed Tarentum Military. Ronovi seen for the first time with her eyepatch, circa 23 ABY. After leaving Prakith, Ronovi began to participate in larger campaigns directed by the clan summit. As she was still relatively new to fighting on a grander scale, she did not make much of an effort to protect herself physically. Doni Tzu's absence did not help, as Ronovi's Force abilities were still raw and unhewn, making it difficult for her to concentrate while engaged in combat. Ultimately, such carelessness brought about a dramatic injury during a clan siege on the abandoned Renegade, which was plagued by dark and dangerous Force entities. During a conflict with one of her fellow Tarenti aboard the ship, Ronovi was struck in the face by a lightsaber, resulting in the loss of her left eye. 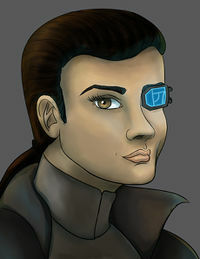 A cybernetic eyepatch brought back most, if not all, of Ronovi's vision, a design she chose over a more organic look for the purpose of intimidation. It was even rumored that Ronovi refused anesthesia when she underwent surgery, submitting herself to outrageous pain for the sake of her quest for power. While her dreams of being a physically perfect warrior vanished, this did not offset her long-term goal of ultimate strength and technique. She was recognized for her work as both Lieutenant Colonel and Sergeant of Arcano Signum and offered the available position of Aedile in House Cestus by Anshar. Ronovi accepted the job and traveled to Koros, where she settled into the Cestians' complex aboard the decommissioned Corsair. Once there, she got to know Kazarelth Talismarr, the house's Quaestor, and found him to be a suitable ally and compatriot. 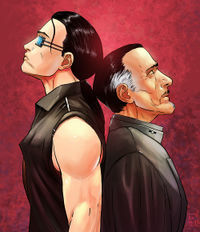 Kazarelth and Ronovi, as Quaestor and Aedile, were both significantly younger and less experienced than many other members of Tarentum by the time they became the leaders of Cestus. However, with their youth came fresh ideas and proposals to increase recruitment rates and strengthen the house as a whole. Becoming an official part of the summit also gave Ronovi the opportunity to mentor her fellow Tarenti, and she took on Jaron Kai as her first apprentice shortly before Tarentum was once again called to war. "She is the only link I have remaining to everything I once cared for. You will not take her from me!" Ronovi during the Liberation of Antei, circa 24 ABY. Ronovi was one of the many Tarenti who participated in the war campaign known as Unification, during which Brotherhood forces moved to reclaim their former homeworld Antei from a sect of Jedi led by Omancor Crask. While on the ground, the newly promoted Dark Jedi Knight and Colonel of the I Corps worked alongside her recently returned master, her apprentice, and members of both Gladius and Cestus in several operations to overtake droid battalions as well as Jedi forces deployed to the north of Adas. Ronovi was also subjected to a near-conversion to the light side, being saved in the nick of time by Doni Tzu before the Jedi finished the job. 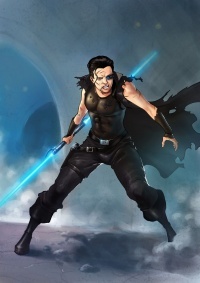 In the final days of the war, Ronovi aided Tarentum in the occupation of Codei Prison and was a witness to the conspiracies and subsequent death of Sun Vail, sister of the exiled Dark Jedi Bane. However, the Epicanthix would remain mentally affected by her close encounter with the light side, and she swore to herself that she would eliminate her dependence on others for survival. As soon as she returned to Yridia, Ronovi ended her apprenticeship with Doni Tzu, moving away from the role of student while still maintaining an alliance with her former master. Unfortunately, she no longer had an apprentice of her own to teach, as Jaron had disappeared during the reclamation. Even though Tarentum suffered multiple casualties from the conflict, its leaders did not ignore Ronovi's major contributions to the war effort. She was given two field promotions, becoming an Equite as well as earning the rank of Brigadier General while still positioned on Antei. Subsequently, she was granted control of the Corps' First Division and further established her place in Tarentum history. Anshar and Oberst also decided to award Ronovi the prestigious Sapphire Blade for her service to the clan and the Brotherhood, and they offered her the open position of Quaestor of Cestus following Kazarelth's resignation. Ronovi agreed to lead with Vai Azexel as her second-in-command, and she made it her primary goal to continue to empower the house as the clan's battle wounds began to heal. Despite Ronovi's attempts to become more self-reliant, she did not expect her past ties to be broken so suddenly. For her first official mission as Quaestor, she was instructed to return to her homeworld to discuss war recovery efforts and new taxation. After the tense meeting between Yridian and Tarentum officials, several Cestians continued to observe Eden City until a PCL 27 freighter abruptly crashed into Yridia IX's surface. While Ronovi and her sister survived, the two's parents were both killed from the impact and subsequent destruction. Later that evening, the Templar beheaded Sarit with her lightsaber so that the latter would not tell Yridian officials that the crash had been an assassination attempt, and Tarentum the target. The Eden City Tragedy left Ronovi with a very disturbed mindset. Her father's untimely death affected her the most, and she wished to avenge the man who had assisted her in her journey to the dark side. Her sister's hasty murder, however, left plenty of time for regret, and Ronovi turned to the Force as well as combat for comfort. At the same time, she focused on reforming House Cestus structurally into the Hieros Lokhos ton Taras, allowing it to operate like a sacred band. Seen as a vital asset to the clan, she was summoned to Castle Tarentum and selected as the new Proconsul after Anshar yielded the throne of Prince of Yridia to Oberst. Ronovi led Tarentum forces to Yridia IV where they intercepted and killed Adamu, a powerful Dark Jedi responsible for several of the attacks that had plagued the Yridia system. As it turned out, three once trustworthy agents of the clan, known as the Keepers, had been secretly working with Adamu and others to bring about massive amounts of death and decay to the fiefdom. Ronovi grew even more aggressive and vengeful as a result of such betrayal and the death of most of her family, but because of this dramatic chain of events, her connection to the dark side was stronger than ever before. If she had ever doubted her decision to become a Dark Jedi, such thoughts were gone, perhaps permanently. "You're not the sister I once knew." Ronovi, PYRG, circa 26 ABY. Ronovi saw and endured more than she ever bargained for during her tenure as Proconsul. During the Sixth Rite of Supremacy, she fought valiantly alongside her fellow Tarenti for the dominion of the Killik-infested planet Salas V. However, Tarentum fell short of gaining the title of First Clan, although they were able to subdue and crush the opposition stemming from Scholae Palatinae and Plagueis. Independent House Revan, responsible for crippling several of Tarentum's forces, became the First House of the Brotherhood, besting Taldryan for the prized planet. The Tarenti returned to the Yridia system with their heads lowered in disappointment, and soon, tensions began to rise within the houses. Ronovi paid little attention to the impending turmoil at first, instead deciding to deal with two criminal families that were frustrating the governor of Yridia IX. It was in Eden that the Prelate found her brother Yaske, who had returned to the metropolis to avenge Sarit's death after he had disappeared from the Tarentum Navy. While Yaske had become a powerful warrior since his piloting days, Ronovi still outmatched him, digging her sapphire blade into his heart and relishing in his death. This event concluded the long overdue demise of Ronovi's entire family and made her the only surviving Tavisaen. After literally and figuratively washing her brother's blood from her hands, Ronovi returned to Castle Tarentum, only to learn that the houses had succumbed to inner conflict and direct disobedience to the clan summit. Examples of such disreputable behavior included a distrusting House Gladius' brutal attempts at self-sufficiency, as well as House Cestus' division into two warring factions when a priceless artifact was discovered deep below the Corsair facility. Most of all, however, house loyalties were overshadowing the vows that the Tarenti had made to Lord Khyron, the Sith King. Oberst and Ronovi knew that they had no other option but to close Cestus, Gladius, and Tridens, replacing the houses with the newly established House Kaerner and House Reinthaler. When the dust of the clan's rebirth had cleared, Ronovi emerged as the newest Tarentae and Consul of Tarentum, becoming only the second woman in the clan's history to assume the throne. "There are things that even the Dark Lords fear hidden in the Dark Vault. We are the guardians of those secrets." Ronovi alongside Scion Altera and Dralin Fortea circa 27 ABY. The future was not bright for Tarentum. Ronovi had much on her plate as Consul and as a newly promoted Major General, making instrumental changes to the clan's structure and hierarchy. 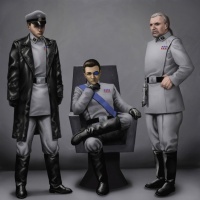 Demanding another reformation of the Tarentum Military, she shut down the I Corps and introduced the Yridian Surface Command, headed by High General Sato Tarentae and Fleet Admiral Sith Bloodfyre-Tarentae. When infrastructural development on Yridia IV went awry and anti-Tarentum sentiments began to spread among various dissidents, Ronovi declared a new state of government in the Yridia system known as the Yridian Kratocracy, in which the name of the Sith King was glorified by all. Alongside Sashar Arconae, Consul of Clan Arcona, she helped institute the Estle-Eden Axis, which was based on the Treaty of Kessel signed by Tarenti and Arconan officials several years before. And through it all, she consistently supported and communicated with her two apprentices, Syrna Valkiss and Giovanni Palermo. However, in her bold attempt to stabilize the young kratocracy, Ronovi could not prevent the impending decimation within the clan’s dominion. In 27 ABY, a cult known as the Church of Infinite Perception invaded Yridian space after the obliteration of Tarentum's entire naval fleet save for the Magnus Kaerner. It was soon discovered that the Church had partnered with Lady Nilani, a former servant of the Keepers, and after Yridia IV was seized, dozens of Tarenti and army troops were killed. Ronovi called on the Arconans to help the beleaguered clan and alerted Grand Master Muz Ashen of the threat, and later, she confronted Lady Nilani in Castle Tarentum and killed her with the assistance of Stanson Rend. By the time the Dark Council's fleets arrived, Arcona and Tarentum had worked together to kill the Preceptor of the Church and destroy the cult’s control over Yridia IV. The costs of the attempted coup were dear, and Tarentum’s numbers suffered greatly due to the conflict. Shortly after the attempted incursion, the Grand Master declared the Brotherhood to be in disarray and downsized all six of the clans to houses, and Tarentum was forced to close Houses Kaerner and Reinthaler and reform its battle teams. Ronovi was left emotionally wounded by the radical changes in Tarentum's structure, especially after Lord Khyron indirectly initiated a rampant Rakghoul plague within the Yridia system in order to challenge her rule. She began to believe that she could not be the harbinger of victory for the Tarenti as once expected of her, deciding that she had overstayed her welcome as Prince of Yridia. On a whim, the newly demoted Quaestor traveled to Lyspair, home of the Shadow Academy, and devoted much of her time to more scholarly studies. Taigikori Aybara, the Academy's Headmaster, took Ronovi under his wing and began to teach her the darker arts that the libraries and other facilities had to offer. As a result, the Exarch abdicated the throne of Yridia in 28 ABY in order to focus primarily on her duties as Taigikori's Praetor. This allowed Sith Bloodfyre to become Prince for a third time and officially ended Ronovi's five years in consecutive leadership positions. "You started out as some petty fighter, became the ruler of the entire system you called home, and then...became some petty fighter. Good job, Ronovi." Ronovi the Arconan, circa 29 ABY. Comfortable with her new position in the Shadow Academy, Ronovi went straight to work on various new courses and degrees while dividing her time between Lyspair and Yridia. The knowledge that she was imbibing enticed her more than she expected, especially when she had become so accustomed to combat and military operations. As she delved further into dark sciences and philosophy, she began to wonder if perhaps her true path for perfection lay in a different direction entirely. Ronovi was later rewarded a Ruby Scepter for both her contributions to the Academy and her devotion to Tarentum as Quaestor and Tarentae. As time went on, Ronovi grew more and more disillusioned by Tarentum proceedings. The Yridian Kratocracy had crumbled in exchange for fanatic religious sects, and the Tarentae had once again become withdrawn in their own politics. As the Fourth Independence Games began in 29 ABY, Ronovi noticed that the Tarenti were returning to a harmful state of isolation and ennui. Most of all, she was angered by the casting aside of various projects and objectives that she had prioritized as Prince in favor of the Tarentae's families and estates. Ronovi ultimately abandoned Castle Tarentum, returned to Eden City, and decided after weeks of contemplation that she would go somewhere else if her accomplishments were to be ignored and her presence unwanted. She sacrificed the Tarentae name in order to join the newly reclanned Arcona, where many of her allies and friends now resided. Her history in Tarentum, spanning seven years, would become nothing more than a distant memory. Accompanied by Stanson Rend and Giovanni Palermo, Ronovi traveled to the Dajorra system. She was welcomed by the Arconan summit in Estle City and invited to join the ranks of House Qel-Droma as a member of Shadow Gate, a team that operated along Port Ol'val. However, Taigikori demanded that Ronovi spend more of her time on Lyspair, and each duty that she subsequently undertook seemed to foreshadow her future endeavors within the frosty corridors of the Shadow Academy. Ronovi and Taigikori Aybara, stewards of the Shadow Academy, circa 29 ABY. Ronovi proved herself to be a worthy vassal of the Shadow Clan, becoming a stalwart Arconan vigilante on Ol'val and gaining favor with her summit. At the same time, the events surrounding Lyspair concerned her. Liu Van Dae, an enigmatic Jedi hellbent on killing the Grand Master, fought and mutilated Taigikori within the Dark Vault. In the aftermath of her superior's injury, Ronovi continually warned the Headmaster not to be lax on security, and she could tell that the presence of the light side house Odan-Urr, along with the growing numbers of dead within the Brotherhood, was striking an angry chord within the other six sovereign houses and clans. She did not have to wait long for war. The Invasion of New Tython was imminent, and Muz ordered the Brotherhood to besiege the temples and fortifications of Odan-Urr. 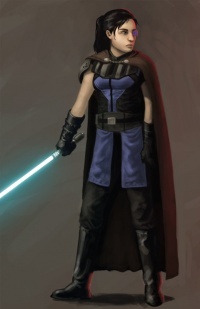 Ronovi fought within the legions of Qel-Droma, pleased that she could take vengeance on the Jedi who held fellowship with those who had attempted to convert her to the light side several years earlier. She proved to be not only one of the most valiant warriors of Arcona, but also of the entire Dark Jedi Brotherhood, winning twenty-five Jedi's lightsabers as bounty after she gleefully slaughtered them. Once again, Ronovi's power and effort garnered attention from her superiors, and Taigikori and Muz honored her with the title of Second Hero upon her return to Anteian space. In the final days of her residence within the Dajorra dominion, Ronovi sided with the Entars in order to end the War of the Three Families. Her decision to ally with the clan summit was due to her abhorrence of internal division, and she was determined to put a stop to Teroch Erinos, who had vowed revenge for the death of his father Sashar. Shortly after the chaos in Arcona had subsided, Ronovi was unexpectedly called back to Antei and told to stay on Lyspair, as Kir Katarn had abruptly resigned from his post as Justicar. She soon learned that Taigikori had been selected as Kir's successor, and that she, the first woman to ever be offered stewardship of the Shadow Academy, would be appointed Headmaster. For the first time, at only the rank of Primarch, Ronovi entered the restricted areas of the Dark Vault, where the malicious aura of its treasures, including yet to be studied holocrons, awaited her. "Leave. Your capabilities as Headmaster have been compromised." Ronovi during the events of Horizons, circa 30 ABY. Following the positive recognition she had received during the Invasion of New Tython and her time in Arcona, Ronovi expected a long and prosperous reign as Headmaster. She took on her tasks with vigor, becoming involved in various inner modifications to the Shadow Academy's departments, practices, and archives. Her visits to the Dark Vault, however, grew disturbingly more frequent, as she compulsively examined and re-examined holocrons for the sole purpose of extending her knowledge. She looked to various dark side artifacts to enhance her physical and mental capabilities, and she became heavily influenced by lore and history that she could not fully fathom at her present rank. As a result, Ronovi became increasingly difficult to work with, her attitude growing more sinister and her outbursts of violence gaining notice from the Dark Council. The Horizons Crisis was detrimental to the Academy, as the Horizon plague first seemed to emerge from the initiate ranks on Lyspair. An attempt to quarantine the facilities partially failed, and soon afterward, Ronovi felt her connection to the Force slip away, one of the initial symptoms of the plague. The loss of a major source of strength, coupled with the dramatic changes to her mood and personality, nearly resulted in the Headmaster's destruction of the Shadow Academy and everyone in it for the sake of eradicating a potential pandemic. When news spread that the plague had not originated from Lyspair, and inoculations were hastily administered to the infected, Ronovi's brash decisions were viewed with harsh skepticism. Therefore, she intended to compensate for her lapse in judgment and power by hoarding holocrons and artifacts so she could further study them. Such paranoia and obsession frustrated Benevolent Taldrya Whiner, Tribune of the Holocrons, who demanded that the items be returned to him after what he viewed to be adequate analysis. Ronovi refused to give up the holocrons in her possession and continued her self-indulgent research. Benevolent, unbeknownst to her, reported her behavior to Muz, who traveled with him to Lyspair. Upon witnessing her physically lash out at the Son of Taldryan in the Dark Vault, the Grand Master instructed Ronovi to depart from the Academy, thereby ending her short-lived dynasty as Headmaster. The ousted Epicanthix wheeled an entire cabinet of Whyren's Reserve onto a prepared Starwind-class pleasure yacht, and she orbited Antei in a drunken despair before attempting to leave the system. The dangerously intoxicated Ronovi proceeded to key in random coordinates, jumped into hyperspace, and re-appeared in the Stygian Caldera, where the dark side pulsed within the perilous nebulae. "If you become my Wrath, you will be viewed as trustworthy. Perhaps our superiors will build the false assumption that you are apologetic for your past behavior." Ronovi the Plagueian carrying enemy sabers, circa 30 ABY. Having fallen unconscious shortly after the leap to the Stygian Caldera, Ronovi allowed her yacht to spin out of control, unintentionally sending out a distress call. The IFF was almost immediately picked up by the Ascendancy, the flagship of the Ascendant Fleet, and several members of House Plagueis were summoned to retrieve the deposed Headmaster. While Ronovi lost everything on the yacht, her stash of whiskey included, she made a steady recovery in the medical bay and was offered refuge by Tra'an Reith, the Dread Lord of Plagueis, and Solus Gar, the Dread Lord's Wrath. Solus had served as Ronovi's Praetor before being stripped of the position after his superior's departure, so the two already knew each other quite well. Ronovi had no desire to participate in any of the proceedings of Plagueis for some time, preferring to stay within her designated quarters and drink whatever alcohol was offered to her. She reluctantly returned to duty, however, when the Grand Master ordered all of the houses and clans to begin a conquest campaign known as the Dark Crusade. She first joined the newly established battle team Ajunta Pall and accepted the task of seizing Archibald Zoraan's flagship, the Avenger II, which was ultimately sent off to be refitted and modified for Brotherhood purposes. Plagueis, however, was not willing to stand aside and let its sister units take the spoils so easily. The Ascendant House proved instrumental to the occupation of the Sith World Nfolgai, where Ronovi and Solus battled the forces of the One Sith and consequently murdered a Sith Lord by the name of Yobd Nan. Harboring a potent bitterness and disdain for anyone who was aligned with the Dark Council, Ronovi's only desire was to seek out revenge against those who had challenged her power over the Shadow Academy. Following the invasion of Nfolgai, she decided that Plagueis would be the weapon she would utilize on her quest for vengeance, exploiting her alliance with Solus in order to force him into compliance with her machinations. Plagueis later moved to conquer the planet Khar Delba, but Xander Drax, a former member of the Brotherhood and Yobd Nan's apprentice, captured and tortured Solus and Ronovi within Lord Naga Sadow's secret citadel on Khar Shian. The two Dark Jedi later attempted to kill Drax, but the Sith Lord escaped after Solus chose to save Ronovi from being crushed under a crumbling wall of the citadel. Ronovi reported the event to Tra'an, who discharged his second-in-command as punishment for his alleged weakness. Then, without hesitation, he offered the open Aedile position to the Epicanthix, and she was subsequently appointed Wrath. "We are paltry meat scraps compared to your forces. We know now that the only way to destroy your Brotherhood Is to eat away at it from the inside out. We need insiders like you." Ronovi and Xander Drax, circa 31 ABY. Ronovi's plan to seize full control of Plagueis ensued swiftly and effectively. After inebriating the minds of both the Force-sensitive and non-Force sensitive troops with negative thoughts regarding the current leadership, she threatened to kill the Dread Lord if he did not immediately resign and leave the Ascendant Fleet to her. Tra'an, prepared to leave his Quaestorship anyway, conceded without a fight, while Alaris Jinn, who had relied on Tra'an for his influence over the house, departed from Plagueis and became a member of House Taldryan. Successfully launching a mighty naval campaign against Athiss, Ronovi encountered Xander Drax once again above the Sith World's surface. The Sith Lord had been named Admiral of the One Sith's fleets, but his power and prowess weren't enough to defeat the incoming onslaught. Plagueis and Naga Sadow easily overcame Drax's initial assault, with Plagueis retrieving the most spoils on the planet itself. While Ronovi began to receive accolades for her efforts as Dread Lord, her erratic moods, despite her return to the Dark Council, did not improve. She hastily removed Ka'Hava'Ve as her Wrath shortly after the Athiss campaign and replaced him with Arden Karn, who showed potential as a leader and ally. While en route to Kalsunor to prove herself against Arconan forces, Ronovi started receiving unexpected and cryptic transmissions in her private quarters aboard the Ascendancy. The messages turned out to be from Drax, who had managed to break into the Dread Lord's communication links, as he could not speak to her directly using the Force. He coaxed her to switch sides and join him in his efforts against the Brotherhood, as her work as Quaestor had not brought her any closer to her goal of killing Muz Ashen and Benevolent Taldrya Whiner. Fearing that she would become paralyzed and subservient to the Grand Master once again, Ronovi willingly began secretive talks with Drax to strengthen the One Sith. What she did not know was that Tra'an, with some tips from Arden, was listening to the transmissions, which he was now capable of hacking into. "Out of all the ways I could have died - by lightsaber, by explosion, by martyrdom - this is the 'kind death' you offer me?" Plagueis's campaign on Kalsunor was well-fought, but Arcona, holding true to its reputation as a leviathan, snatched most of the spoils and gained the most praise from the Dark Council. Throughout the house's time on the planet, Ronovi had begun to formalize plans with Drax to attack Brotherhood units from the inside under the guise of rivalry. The first house to be confronted would be Taldryan, at Ronovi's request, because Alaris and Benevolent were members. Catching on to the scheme after forcing Tra'an to affirm that Ronovi was indeed betraying the Brotherhood, Alaris demanded that he be the one to kill her, since he blamed her for his downfall in Plagueis. Muz seemed willing to allow the Twi'lek to commit the deed, accusing the Quaestor of treason, and Tra'an, feeling sympathy for his compromised ally, knew that he would have to act faster. He asked Ronovi if she would join him for a drink at the bar aboard the Ascendancy, in order to celebrate her so far successful reign as Dread Lord. Ronovi was of course suspicious, deciding to take her personal flask of whiskey with her in order to avoid fatal consequences. At the bar, she heard firsthand how much Tra'an, Arden, Alaris, and Muz knew of her plan to align with the One Sith. Warning her that Brotherhood forces would soon come to arrest and execute her, Tra'an told her that he had planned a kinder death for his comrade. He pointed to Ronovi's flask, informing her that her whiskey, in fact, had been poisoned by a Plagueian slave who had infiltrated her quarters under the pretense of cleaning it. Bemoaning her anticlimactic demise, Ronovi toppled from her stool, paralyzed by a tasteless toxin, and mentally slipped into darkness. To those witnessing the scene, it appeared that the Epicanthix had simply succumbed to alcohol poisoning. Ronovi the bodyguard, circa 35 ABY. "Every enemy you’ve known and yearned to seek vengeance on is either dead or irrelevant. You can relax, take a deep breath, and get readjusted." The order, structure, and leadership of the Brotherhood changed drastically over the next four years. Following Muz's abdication of the Iron Throne and Pravus's assumption of power, priorities had been shuffled, and Plagueis had recovered its status as a clan. The One Sith were no longer a threat, and Drax was dead. However, it was the departure of Consul Teylas Ramar, which resulted in the ascension of a new leader who held no direct opinion of Ronovi in one way or the other, that convinced Tra'an that the Epicanthix could return to the Brotherhood in full capacity. After all, she had not actually been killed, but instead been rendered comatose before being put into a delicately maintained stasis chamber in Tra'an's personal section of the di Plagia vault. Toward the beginning of 35 ABY, Tra'an decided to remove Ronovi from stasis and bring her back to the ranks of Plagueis. While she initially confronted her former comrade for obvious reasons, she was ultimately convinced to rejoin the Brotherhood, especially now that she was no longer considered a traitor by those in charge. With a reconciliatory drink proffered to her, she followed Tra'an to Aliso, the new Plagueian outpost. It was there that Ronovi subjected herself to rigorous training and meditation in order to regain her physical strength, her mental stamina, and her connection to the Force. Readjusting to the Brotherhood, after so much time spent in a state of suspended animation, was laborious and sometimes humbling. Many of the people whom Ronovi had fraternized with were either dead or no longer a part of Plagueis, and for many months, she felt as if she were merely a shell of her former self, defeated and demoralized. Her desires for revenge also quickly dissipated, as Muz and Benevolent were no longer part of the Dark Council, but that left her with no course in her life for the first time. The timing could not have been more perfect, as Ronovi was then approached at an Aliso City cantina by the freshly appointed Dread Lord, Selika Roh, and given a new and unexpected job: Bodyguard. Ronovi, the Dread Lord's Wrath, circa 36 ABY. "The Grand Master forced me out of the Academy the moment I drew my saber and tried to forge my own destiny. When I tried it again, I was poisoned and stuffed into a temporary coffin until I mellowed out. And maybe it’s worked." Partially because she wanted to please Selika and partially because she had nothing better to do, Ronovi once again became active in Plagueis, serving in other roles apart from glorified security personnel. She appeared on the front line of battle when a Geonosian hive called the Valneikian Hive awoke from stasis and attacked Aliso City from a network of underground caves, and she assisted in the relocation of said Geonosians to the Valneikian Spire. Later on, the Dread Lord awarded Ronovi her second sapphire blade for her services to the clan and requested that she accompany her to the planet Nancora, in order to obtain a scroll allegedly written by Darth Plagueis himself as well as confront the Brotherhood’s newest enemy: an anti-Force organization known simply as the Collective. Given that she was used to serving as a top notch soldier, Ronovi emerged from the Twelfth Great Jedi War relatively unscathed, and her respect for and dedication to Selika grew stronger. Rumors quickly spread among the Plagueian elite concerning the intensity and significance of the two women’s relationship, though neither of them would confirm or deny how close they truly were. When not focused on being the Dread Lord’s personal guard, Ronovi also spent quite a bit of time with a non-Force sensitive named Laren Uscot, ultimately convincing him that serving as Praetor under Headmaster Farrin Xies was only reinforcing the pattern of conformist indoctrination that she firmly believed the Shadow Academy was imposing. These interactions only emphasized the fact that, despite her troubled past, Ronovi still held sway over others as an advisor, mentor, and friend. Ultimately, in the aftermath of Pravus stepping down as Grand Master and choosing Telaris "Mav" Cantor as his successor, Selika abdicated the Dread Lord's throne and assumed the position of Herald of the Brotherhood. Laren, who had been the Dread Lord’s Wrath for a brief period of time, left Aliso altogether, though it was unclear as to whether his departure was of his own volition or he was chased out by the di Plagia circle. Selika personally ordered Arden, who had been selected as Plagueis's new Consul, to appoint Ronovi as his Proconsul so that she could serve as the former Dread Lord’s eyes and ears on the summit. Ronovi hesitantly agreed to work with her former second-in-command, only this time, she was now his Wrath. Ronovi's battle armor and coat. From a first look, Ronovi is looming and intimidating. As is typical of an Epicanthix, she stands over an impressive two meters in height, with a long torso and strongly built legs so that she towers over allies and opponents. Her weight gives her a more slender look, but in truth, she is built very much like a brick, being tough, sturdy, and battered. She is very well-toned, with broad shoulders and a chest that seems to belong more to a man than to a woman. Her right ear is slightly mangled, the lobe having been removed by a blaster bolt. With her build being very appropriate to that of a soldier, Ronovi's other physical traits also complement her sharper and darker appearance. Her rounder jaw and more subdued cheekbones contrast well with her broader nose and thicker eyebrows. Her face holds a refined, almost noble aura about it despite a pronounced scar on the left side of her jaw and some small, white marks that line her chin, lips, and forehead. She keeps her naturally black hair long, usually tied back with a few strands falling across the nape of her neck and her collarbone. Overall, she has strong masculine features and has even been mistaken for a man from a distance. Ronovi wears both civilian garb and military as well as ceremonial uniforms. 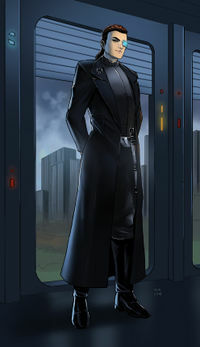 Her battle attire includes standard military black boots and breeches, a bronze-hued breastplate and gauntlets, and a sleeveless black coat with silver accents, which replaces the standard Dark Jedi cloak or robe. Under the coat, she keeps a small flask at her side that is normally filled with Whyren's Reserve, a rare and expensive brand of Corellian whiskey. 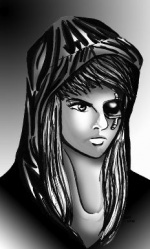 Her left eye is a cybernetic implant, an electric patch that works as a vision replacement. Her organic eye, once a deep brown, has become amber due to the dark side's physiological effects on her body. Initially, Ronovi appears to be carved from a block of cold marble, but once closer, one can see the intricate details of her appearance, allowing her the threatening persona of a warrior. Ronovi's primary weapon is her lightsaber. Her first personalized lightsaber was crafted by Shikyo Keibatsu, who was the Herald of the Brotherhood at the time. Equipped with a bronze plasma blade, this single-handed saber boasted a long handle with a wooden texture and a brass-like tang guard carved around the emitter, easy to grip and beautifully constructed. It is safe to assume that Ronovi purposefully had the hilt resemble that of an ancient war sword, given her former reputation as both an Obelisk and a general. In order to better accommodate her evolved saber skills, Ronovi now wields a saberstaff with cerulean blades and a bare-boned silver and black hilt, built by Bale Andros. 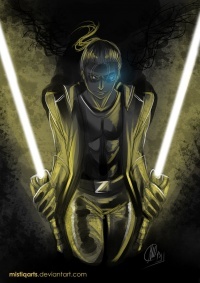 Ronovi is a master of the brutal lightsaber form Juyo. When using Juyo, she fully demonstrates her caliber as a brawler and warrior, unleashing a primal monster from within as she batters against her enemies with pure, unfiltered strength and power. Because of her aggressive and almost dance-like attacks, her Force senses are amplified, as well as her capability to more efficiently execute abilities such as Force Rage in order to channel her emotions into formidable weapons against her foes. When not using Juyo, Ronovi practices her secondary lightsaber form, Vaapad, which she learned while wielding a single-handed lightsaber. Rather than expelling her emotions outward in one big tornado of movement, Vaapad allows her to concentrate more adequately on the mindset and potential fury of her opponent, becoming more mentally stable and withdrawn as she fights. This also proves beneficial if she wishes to trick or belittle her enemies, luring them into a false sense of security with Vaapad before displaying her true identity as a Juyo adept. Ronovi and Selika Roh ready for battle, circa 35 ABY. "If I had to choose between fighting a Rancor, or Ronovi...I'd take the Rancor." Besides her lightsaber, Ronovi utilizes various other weapons. She is a frequent wielder of heavy blaster pistols, normally carrying at least one on her person during battles. While she prefers using blasters in the style of the JSP-14 pistol or the DH-17 pistol, she sometimes resorts to using hold-out blasters and scout pistols due to their size and sleekness. Having dabbled in swordsmanship in the years before and during her time in the Brotherhood, Ronovi also deploys swords, daggers, and knives in combat. She occasionally totes her two sapphire blades, relying on them as back-ups in case she is disarmed of her primary weapon. On select missions, Ronovi carries vibroshivs as well as vibroknucklers, which allow her close and almost intimate contact with her opponent before slitting his or her throat. When Ronovi wishes to enact a slower demise, she uses her ruby scepter as a blunt weapon. Ronovi is trained in Broken Gate and has a rudimentary understanding of the basic patterns and principles of Mandalorian Core. Vibroknucklers also give her an excuse to go straight into hand to hand combat, since she can use the vibroblades for defense and bring her enemy to a bloody death. Ronovi and Selika Roh practicing Force combat, circa 35 ABY. Due to her emphasis in physical power, Ronovi can be considered a minimalist of the Force in terms of actual Force attacks. This was once due to her Force powers being feebler than those of her equally ranked allies, and she did not feel confident using them. Although she has now mastered several powerful Force abilities, she has gotten used to counting on her own senses and instincts rather than on her Force control, though she does depend on the Force to amplify her physical prowess. Since her removal from stasis, Ronovi has also admittedly become quite a fan of using Force lightning. Because she is an Epicanthix, Ronovi has a rare genetic immunity to mental intrusion from the Force. However, this does not mean that she cannot be deceived through mind tricks, illusions, or terrors, and due to her loud and bombastic nature, sometimes she simply spills the beans to whomever is interrogating her, especially if she is inebriated. Her genetics also prevent her from telepathically communicating with others through the Force, which can be a frustrating setback in certain combat situations. Still, due to her deep immersion in dark side lore as Headmaster, Ronovi has become far more resistant to Force attacks, capable of shrugging off or deflecting Force assaults directed by all but the most powerful Equites and Elders in the Brotherhood. 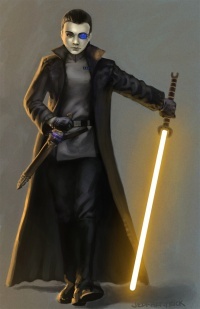 Ronovi is not a follower of any specific Force doctrines or teachings, despite the fact that she has grown familiar with several Force philosophies. This is because she simply thinks of the Force as a tool rather than a mystical entity. She maintains a down-to-earth, no-nonsense perspective of the dark side, practicing its arts with the idea that it assists her toward a greater end goal. To her, the Force is a manual, not a spiritual guide or almighty deity; what is most crucial is the individual power garnered from the Force and the results of its teachings and its history. While many compare such a mindset to Obelisk ideologies, Ronovi claims that it is merely common sense. "If she wants you to be her student, you'll know. You'd do better to apprentice yourself to a hurricane - less temperamental, less dangerous, and simpler. And drier." 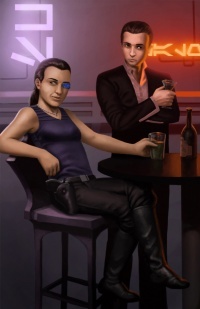 Ronovi and Dralin enjoying drinks at The Mirage, circa 27 ABY. Ronovi's personality has rapidly evolved throughout the years. She was a hot-headed, power-hungry child and adolescent, a true fighter at heart and more brawn than brain. As she grew older, however, she assumed more of a military mind, both crafty and calculating as a general in Tarentum and an advisor in Arcona. 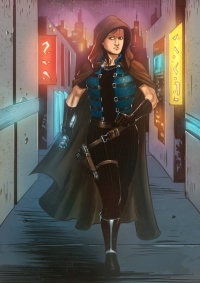 The Shadow Academy later gave her an opportunity to sharpen her senses and her understanding of the galaxy, as she was permitted to study the archives and artifacts of the Dark Vault despite her lower rank. Because of this, she became so steeped in arcane dark side knowledge that, without realizing it, she cultivated the sort of ruthlessness that could lead her to break a man's neck for the slightest offense. 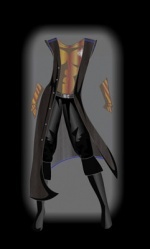 As a result, Ronovi can be called a dark scholarly warrior: Powerful, malevolent, and remarkably intelligent. Ronovi the drunk, circa Horizons, 30 ABY. However, Ronovi's continually growing prowess and intimidating demeanor does not mean that her old habits have faded away. She is still a blunt, sharp-tongued, and cynical character. Despite her strategic abilities, she can become quite spastic on and off the battlefield. Her rambunctiousness, unhindered honesty, and affinity for drinking contribute to her occasionally belligerent behavior. It is commonly known that Ronovi enjoys inflicting pain, treating it like a form of entertainment and emphasizing her more sadistic nature. Fortunately, she is able to keep some of her brutal mannerisms under control, instead handling most non-combat situations with sarcasm, wit, and a casual air. Basically, Ronovi can easily punch a man in the jaw and then tell a joke about it later. Ronovi has few friends, seldom trusting others outside her small circle of allies. Besides knowing Basic as well as Epicant, her fluency in Bocce allows her to communicate with a large variety of species in the galaxy on a militant as well as economic level. She is almost compulsive regarding her equipment and combative techniques, and she cannot tolerate romantic feelings of any kind, even though she is very susceptible to sexual attractions and lustful temptations. Ronovi is recognized by some as a strong mentor, but many others consider her far too dangerous, obsessive, and temperamental to be relied on. Jaron Kai was Ronovi's first apprentice, beginning her training under the then Dark Jedi Knight shortly before the Ninth Great Jedi War. 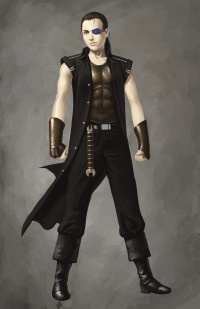 As she was ranked Protector at the time, Jaron had already proven to Ronovi that she was a capable fighter as well as a reliable member of Cestus. The two were also on friendly rather than merely cordial terms, and their master and student relationship was sided with a shared wit and perspective. Unfortunately, Jaron disappeared from Tarentum's set up base during the Reclamation of Antei and has not been seen since. She last held the rank of Jedi Hunter. Syrna Valkiss was Ronovi's second apprentice, beginning her training under the then Obelisk Prelate shortly after she earned the rank of Novice. 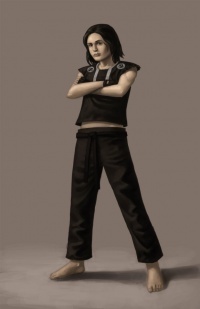 Unlike Jaron Kai, Syrna harbored a much more reserved attitude toward her given tasks and assignments within Tarentum. As Ronovi was once on good terms with Syrna's brother, Severon Vercingetorix, she was aware of the woman's turbulent past and hoped to use it in order to submit her fully to the dark side. When Ronovi left Yridian space in order to join Arcona's ranks, Syrna decided to stay behind and was later killed during the Siege of Eden. She last held the rank of Guardian. 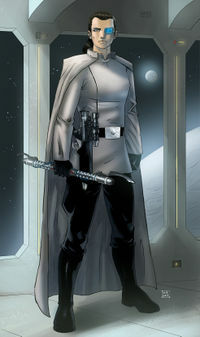 Giovanni Palermo was Ronovi's third apprentice, having held the rank of Jedi Hunter for several years before becoming the then Obelisk Prelate's student. After becoming disenchanted with his former master, he was encouraged to seek assistance from Archean Erinos Tarentae only to discover that the situation would not improve his already stagnant progress. Ronovi, feeling that the long-term Tarenti needed a strong and persistent mentor, placed Giovanni under a strict training regimen, hoping to push him over the last remaining hurdles on his long path to knighthood. It took two more years, but Giovanni was at last elevated to Dark Jedi Knight while serving in Arcona alongside his master, becoming the first and only of Ronovi's apprentices to obtain the prized rank. He has since served in the courts of Estle City as a lawyer. Ronovi was based on a previously written Sith character named Darth Desov, which was used by her creator for informal roleplaying sessions. Ronovi has acquired a large amount of nicknames throughout the years, but the most enduring one is, "Ronnie." Ronovi emerged as Champion of the Independence Games in 29 ABY, taking first place in five events. Ronovi was recognized as the Second Hero of the Tenth Great Jedi War, upstaged only by Benevolent Taldrya Whiner.